Blue sapphire and diamond earrings Carefully crafted and exquisitely designed, this pair of 18K white gold earrings generously adorned with blue sapphires and marquise and round brilliant cut diamonds in prong and pave settings is elegant and one-of-a-kind. 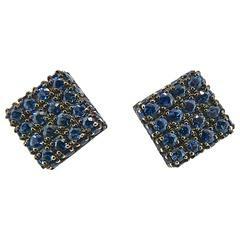 Featuring 200 stones, this pair is the ideal choice to add a finishing flourish to your wardrobe. Diamond Weight: 2.24 cts Blue Sapphire Weight: 2.10 cts IGI Certified: Summary No: 32J055561812 Studio Rêves is a full-service jewellery design house that believes in an unhurried grooming of the stone to bring out its full potential with one-of-a-kind designs.